"Everyone loves a winner." So the saying goes. Not so much. 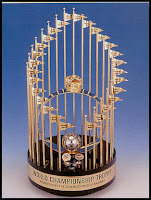 Last night the New York Yankees won their 27th World Series. It is a feat unparalleled in professional sports. The team with the second most World Series, the St. Louis Cardinals, have won 10. In football the Pittsburgh Steelers have won the most Super Bowls with 6. The Boston Celtics have won 17 NBA Championships. The only other team to be close is the Montreal Canadiens with 23 Stanley Cups. And yet the Yankees are not a team everyone loves. It is an interesting phenomenon--bristling at success. We see it in schools. On the My Voice Survey of over 400,000 students throughout the country, just 57% of them agreed with the statement, "I am excited to tell my friends when I get good grades." 38% agreed that students are supportive of each other. And while only 5% agreed that "I am afraid my friends won't like me if I do well in school" that's over 20,000 students! Imagine 20 large high schools in which every student was afraid to be successful. The adults in schools are not much better in this regard. Only 59% of school staff agree that they are excited to tell their colleagues when they do something well. And one-fourth (26%) of the 20,913 school staff members surveyed last year agreed with the statement "I am concerned my colleagues will resent me if I am too successful." Apparently they know not everyone loves a winner. We need to do a better job of making it safe to be successful in schools. We need to realize that success in school, if not in sports, is not a zero sum game. One student's success should not diminish other students or remove from them the opportunity to be successful. A successful teacher should not have to hide that success in fear of her colleagues eye rolls or whispered "Who does she think she is." Along with teaching literacy and numeracy, we need to teach students that succeeding academically, like winning a World Series, is an accomplishment everyone can celebrate, whether it happens to you or your team or not. I'm definitely in favor of supporting people's accomplishments. However, your argument is weakened by using the Yankees as an example. It's analogous to being excited for a guy when he wins the lottery who regularly steals candy from children and kicks dogs. Why would I be happy about that?